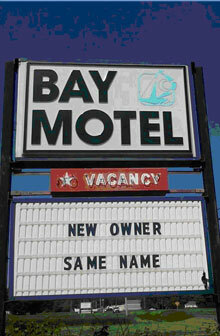 Welcome to the Bay Motel Virginia. The newest old name on the Chesapeake Bay. While we are the same name and in the same prime location in the heart of Virginia’s Chesapeake Bay fishing country, everything else is NEW! Whether you are looking for a central location from which to plan the ultimate Chesapeake fishing vacation or you want to relax and grab a few rounds of golf, the Bay Motel Virginia is the perfect place to hang your fishing rod at night and relax. Since fall 2014 Bay Motel has undergone a complete revitalization after several years of neglect. Every guest room has new furniture, new wall finishes, and new floor coverings; plus new furnishings! The reception area and outside public areas have also been refurbished. First time guests will be pleased and former guests will be astounded at the improvements. The pavilion has the concrete floor and picnic tables - It is ready for you to get together with friends and family to talk over the day and enjoy the evening!! Bay Motel is a smoke free environment in all rooms and common areas. Come see the NEW old name on the bay.